Latest post Fri, Oct 3 2014 8:53 AM by serbanty. 12 replies. i still would like to strike a blow for a smaller Audio Mixer. It could be really simple to provide us editors the option to make that tool as useful as each of us likes it to be. The "Mix Tool Display Options" are an improvement but doesn´t go far enough. I think the "group" button is hugely important. It needs to be bigger and seperated from link and mirror. 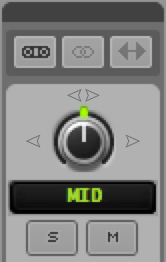 The design of the audio mixer interface is just waste of space. Just compare it to the Effects Palette, Project window, Bins, EQ Tool or whatever - thats effective. The Audio Mixer since MC6 is mostly grey surface. Important buttons like the fader are too small, others are far away from the place where you need them when using the tool. In the following pictures you can see the old Audio Mixer compared to the new, a ReDesign to make each track less wide and to place important buttons where they sould be, one some optional Display Options. +1 for improvements with the audio mixer. These are really good suggestions. How about the option to hide the faders. I usually adjust levels by inputting a value. thats possible already. just klick on the "Fast Menu" in the Audio Mixer -> Mix Tool Display Options -> deselect "Show faders"
How about hiding the pan controlls. They are useless and much too big. Also already possible, using the same method Sven posted above. Oh yes, my fault. But the width of the tracks still stays the same, when you hide the pans? It would be great to adjust the size of the whole audio mixer tool window and to reduce the size of the tracks, too, instead of having scroll bars. Anyone know how to make my preferences for my "Set Display Options" stick? Every time i open MC7.02 i have to open up and deselct pan controls effect buttons & legends! 1- Both the dB level and the A1, A2, etc, selectors be moved to the _top_ of each fader panel. This way everything is in one place. Glancing up and down all the time is frustrating. "The Avid Media Composer Cookbook"
Don't get me wrong, I love the meters in the audio mixer that we gained in MC6. Stops me having to solo 16 individual tracks to see which one has the dialogue. And the new 'Display Options' in MC7 is a good start, but not really a finished deal. I don't think the MC6 complainers will be much satisfied. Firstly the enclosing window does not resize as elements are turned off and on. Secondly the Pan and Volume numeric displays always require a certain width, which limits the number of timeline tracks that can be squeezed in a window horizontally. Thirdly there is a lot of vertical real estate (OS box, audio mxier tab, then 2 lines of dropdowns) before we get to the mixer - which has large black bevels top and bottom with no function, even with all display options off. Fourthly, at the bottom of a fader, next to the fader level numeric display, there is an up/down arrow - which appears to have no use either. Fifthly - The fader 'knob' is also still too small for general use. I'm sure this isn't trivial - but the audio mixer still needs some serious love (as does audio in general). not only should there be a condensed version, btu there should be an easy way to shift select several tracks to gang them together with ease, instead of clicking on each gang button seperately, real annoying ! Ideally something similar to the shift drag option to highlight tracks quickly in the timeline - drag accross gang buttons for example. Also how about option click a gang button in the mixer toggles all gang buttons on & off. Would be great to map the group button to a keyboard button (shortcut). I've tryed but couldn't find a solution to make it work. Second i would love a future that mutes all other tracks than the track i'm clicking on. i.e. If i have 6 mics from A1-A6 and a would like to 'mute' A2-A6 it would spare me some time just ALT + clicking on A1 instead of fading each fader to infinite. Or maybe just fade down the unselected tracks instead by a simple click. I would not prefer removing the unused muted tracks due to sound post prod. The Gang-mode doesnt cut it either.